Nothing says New Years Eve like confetti, and these crisp melt-in-your-mouth raspberry cookies will be everyone’s party favorite!!! Beat egg whites with salt until foaming. Add Jell-O and sugar as you beat mixture and beat until it stands in peaks. Add vinegar and gently mix. Spoon or pipe into small circles on a cookie sheet covered in parchment paper. Sprinkle with confetti sprinkles or jimmies. Bake at 250 degrees for 25 minutes, turn oven off and allow to sit for an additional 20 minutes. Remove from oven and allow cookies to cool completely. My thoughts: These are great with chocolate chips in them if you like raspberry and chocolate together. I opted for confetti for a fun New Years treat! These are like cotton candy- light and fluffy sugar that melts in your mouth and is a tiny bit chewy at the end. A unique and fun “end-of -the-year” party cookie. Want another confetti-themed dessert idea? Try Confetti Cups made with sugar cookies and Fruit Loops—make them in mini-muffin tins for bite-sized New Years fun! Posted in Candy, Cookies and tagged birthday party cookies, candy, confetti, confetti cookies, confetti meringue, cookies, meringue cookies, New years, raspberry. Bookmark the permalink. It is the boxed Jell-O powder- no water added:). Enjoy! Wow, are these a bit like meringues? I love the color and the kick of flavor from the jello would be amazing! I’ve actually never made meringues! I’ve been told these taste and look like meringues though. The raspberry in them is sooo yummy :). Hope you enjoy them! 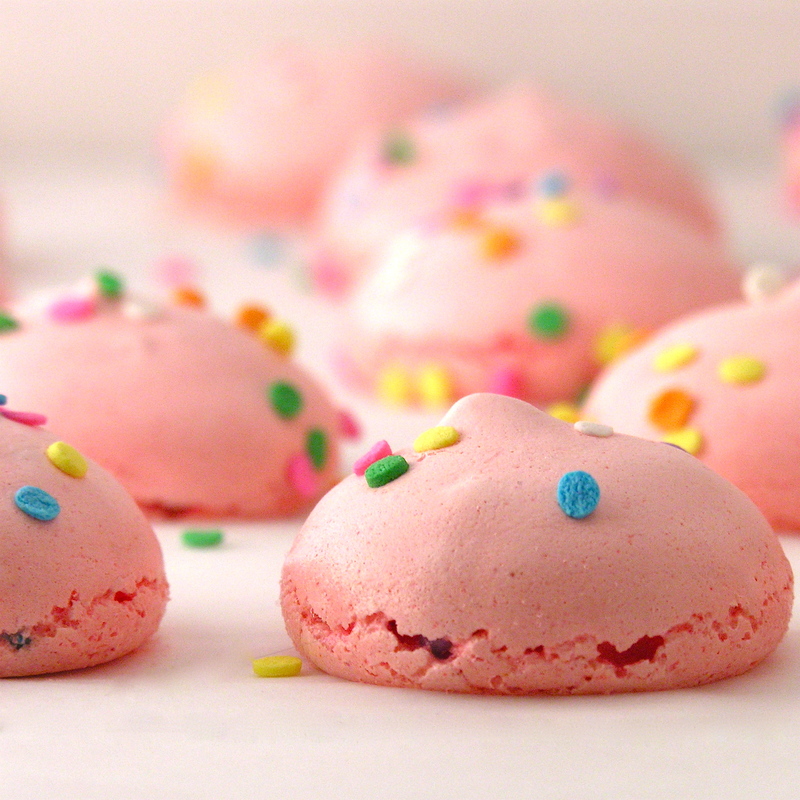 These are so similar to meringue. Just with vinegar instead of cream of tartar. I’m sure the kiddos will like them. If not the staff team will devour them. Thanks for a fun things to do with Jello. These goodies are toooo pretty! Great job. Thank you– and Happy New Year! Love the simplicity of your blog – and Kahlua cappuccino??? YUM!!! These are absolutely delicious! I loved the recipe and the fact that these look so colourful! Thanks Kim! I love all the fun ideas on your blog- so creative! These are so cute! I love your banner too! Thanks– and I love yours! LOVE the confession # idea for your posts too– and I too am a perfectionist and you are right– it takes SO much longer to do things when they have to be perfect- lol! Nice to meet you! These look terrific! 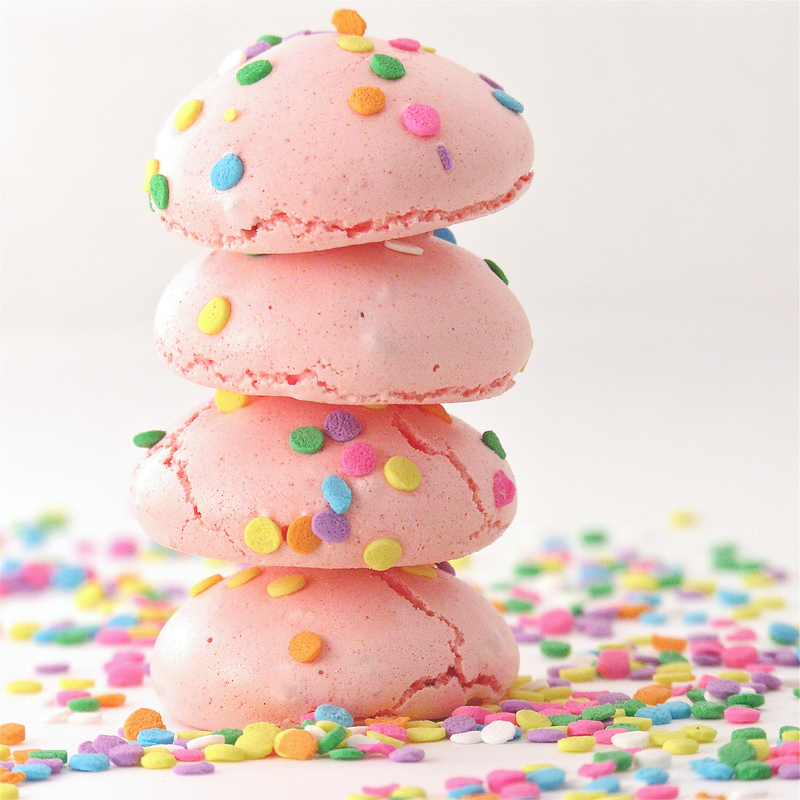 You should try meringues…they are wonderful and light! Are these gluten free? These look delightful. I’m looking at them for my two boy’s “birthday in the woods” party. I’d use grape cuz that’s their favorite and as great as raspberry is, pink is just not a boy color 🙂 anyone know if they make blueberry jello? Jell-O makes a Blue Raspberry flavor, that when made as a gelatin dessert comes out as a very bright blue, simular to aqua marine. It should be the perfect blue for your boys. Could these be made ahead and frozen??? These should be made just before serving (within a day or two) and I wouldn’t freeze them. Will definitely be at my New Years Eve party, they look fabulous! these look so cute. i love your profile photo too. great colors! These are adorable! I wish I had a electric beater at home so I could make them… or maybe I could whisk it by hand… hmmm. Wait….putting my scientist hat on 🙂 Basically, the vinegar is an acid that prevents the foamy egg whites from forming too many protein bonds and collapsing….it keeps the cookie fluffy and full of air while it bakes. If you want some detailed description of this and other questions like why add sugar after whipping the egg whites and why is is it better to use a glass bowl over a plastic one check out The Accidental Scientist— it is really interesting if you want to know the “whys” behind a recipe. Awesome. my young chef to be would be so fired up to mix science with cooking thanks! Do you use white vinegar or cider vinegar? Also, how many does this recipe actually make? I use white vinegar- and it depends on the size you make them. As pictured, about 18-24 cookies. These look FABULOUS!! Cant wait to make them, is on my to do list for this week! Just one question, I am not sure of the oven temperature?!? ( I get slightly confused re: Celsius Fahrenheit etc). Over here in New Zealand,we go by Celsius. Quite a few ‘overseas’ websites/recipes I need to convert. Just wondering what it is?!? Also is this ‘bake’ or ‘fan-bake’? Thanks in advance 🙂 One very excited baker…. These look amazing! I will definitely be trying. I wanted these to be amazing, but I couldn’t get the batter correctly. The cookies were flat, sticky, inedible. I followed the recipe exactly, but used an off brand of geletin (generic). Any idea what I did wrong? Thank you for the tips. I am definitely going to try again! Thanks for the tip Becky!!! I have a question about piping onto cookie sheet- Do you pipe in circle up like an icecream cone top ? I guess I’m really asking if the cookies rise ? It rises a little. But basically keeps the shape you pipe it into. has anyone tried this with sugar free jello……would be a GREAT “protein shot”===looks like you should feel guilty, but you’re actually doing good for yourself!! Can I pin this recipe? Going to make these tonight. Can you tell me approximately how many this recipe makes? I’d like to make them for our Stitching Guild Tea Party next week, but wasn’t sure if it would be enough or if I would need to make 2 batches. I made these, and I followed the recipe exact. The batter was kind of soupy too. They came out gooey and flat. Any idea of what I did wrong? My 1st thought was that it wasn’t beat long enough- it really takes awhile to get it into nice stiff peaks. If you are having a hard time getting it to that stage, try warming your egg whites to room temp 1st, don’t use a plastic bowl (it is more likely to have a grease residue in it than glass) and try a whisk attachment on your mixer. All of this info I got from a website called The Science of Cooking and they do a good job of explaining why those things would help. I have never warmed my eggs and I’ve used regular beaters in a plastic bowl with this recipe in the past…so I don’t know for SURE those things will help, but you can try them. So sorry you had a hard time– hoping that if you try again it will work perfectly for you! These cookies look great! Just wondering if u can tell me how long they will last pnce made, thinking of making them for my daughter’s communion this weekend! I know they are good for at least 2 days (usually mine are gobbled up by then!) As they sit they become less crunchy and more chewy, so I’d recommend making them as close to the day you need them as possible. Have fun celebrating this weekend!!! So i made them yesterday and they were easy and came out great! Just curious if u have made them using other jello flavours, might give them another go with peach flavour or other! I’ve made them in peach and in lime– both were great! They are actually really fun to make in lots of colors for a shower or for Easter– the colors are so pretty together! Glad you liked them– have fun experimenting!!! I made the raspberry ones & they were quite tasty. However, I was having oven problems so they took longer than they should have. This meant I ran out of time to make a second batch. I was planning on trying them in orange & using the mini chocolate chips in them. If my husband ever gets the thermostat problems fixed I look forward to trying this. Sorry to hear about your oven– orange and chocolate? GREAT idea! That sounds wonderful! Hi! It really depends on how big you make the cookies. I get about 18-24 kisses at this size (about the size of a half-dollar) but you could make them a little bigger or smaller depending on how many you need. Enjoy! I stumbled upon this post the day before my daughter’s sprinkles themed birthday party, and knew I HAD to make them for the party. Delicious, easy, and so perfect! My three year old loved being able to help by adding the sprinkles, too. I just posted some pictures here with a link to your blog: http://tikkido.com/node/657 . Thank you so much for this wonderful post! When you say to gently mix in vinegar, can I just use my hand mixer on a low speed or hand mix, or am I supposed to fold it in to keep the egg whites stiff? I used my hand mixer on low- just until it combined. I made these last night. The outside was nice and meringue-like. The cookies look like your picture from the outside, but the inside was still gooey. Was that supposed to happen? I’m going to try to re-bake a few this morning to see if they will cook through. (Could be too late in the process but worth a try). I will still eat them even with the gooey inside. They are delish! If I make mine small they are crispy all the way through. If I make them a bigger they stay a little chewy on the inside….I actually like them a chewy 😉 Try making them a bit smaller if you want them crunchy all the way through! Mine turned out the same way. Crunchy on the outside and gooey in the middle. Still edible, but next time I will make them smaller. They are super sweet too which I don’t like. I am glad I added the chocolate chips. Much better taste! Pretty cookies and I’ll make again but I will adjust the ingredients a little. Can’t wait to try these! I have a similar recipe from my grandmother, and she told me they don’t do well with high humidity, so I’m wondering if that’s what’s causing the sticky results mentioned in earlier comments. Also, if anyone wants to know how to convert Fahrenheit to Celsius, you take the Fahrenheit temperature (in this case, 250) and you subtract 32 (leaving 218). Then you multiply by 5/9 (answer is 121). I always forget how to convert (do you add 32 or subtract it? is it 5/9 or 9/5? ), so I try it out with 212 which is boiling in Fahrenheit, and I know I have to end up with 100 (boiling in Celsius). Oh my word– I’m so incredibly bad at math that I just started laughing when I read your comment. Kudos to you for figuring all that out– I have to google “how many degrees celcius is 350 degrees fahrenheit” to figure that out- lol! Thank you (and your grandma!) for the tip about humidity– that very well could be the reason they aren’t turning out- especially with this recent heat wave! Does the ‘t’ mean tablespoons? or teaspoons? T means tablespoons and t means teaspoons. Sorry if that was confusing! Ah! I made these today and they turned out sticky and wouldn’t even come off the baking paper. But I don’t want to give up on them! I’ve read all the comments so far and I do live in Florida where it is pretty humid… I’m just wondering if there is a way to make it work anyway. Should I spray the baking paper first? Can I somehow make them more dry or something? Aw…I’m so sorry they didn’t work out for you– other than the tips I’ve already given, I’m all out of ideas. It could be the humidity I suppose. Let us all know if you figure out a solution!!!! I want to try them ie a care pkg to a college student…in the school colors of course! So…red and blue…blue raspberry and cherry???? That is such a fun idea!!! I love it! They turn out a pastel shade of whatever color you use though- so I think you will have pink and light blue. Still yummy though!! These are delightful! cant wait to try these kisses for our anniversary! I love your fun and festive posts! I am baking for a sweet 16 party that is this coming weekend and am wondering how long in advance I can make the rasberry confetti kisses and oreo pops. I live in the Bay Area and its cold right now so am planning on storing in airtight containers in the garage. Party is Sat night. Can I make them Tue or Wed? Oh- I’m SO sorry it took me so long to get back with you– you can make the Oreo pops a LONG time in advance. I think the confetti kisses are better fresh. They get a little chewy after a few days– they still taste great but they don’t have that fun crisp texture…even in airtight containers…hope this helps and I wasn’t too late!!!! My grandmother made these and she used to call them raspberry divinity. Hope you enjoy them!!! I just found your site and made these today. LOVE them…keep up the good work!! Thank you– I’m so glad you liked them!!!! Obviously my cooking skills are better than my typing skills. Ha! They are perfect for a baby shower! You could even do some in blue if you can get your hands on some of that Berry Blue Jell-O! I would like to do some orange using orange jello. I would also like to do purple ones but am not sure if there a flavor out there that is purple. Also if I left the confetti off the top I think they would be gluten free. I am having some guests that are gluten intolerant. Grape Jello is purple- although I haven’t tried that one yet. The orange ones are delicious! There is gluten-free confetti out there- I found some on Amazon. Have fun making these!! Depending on how big you make them, the recipe makes about 36-44 cookies. So glad you liked them Kasey!!! Sorry it took two tries- but now you have the technique down! I love the peach and lime flavored ones!! Have fun!! First of all, I LOVE LOVE LOVE your frosting recipes. I do have a question on these cookies. Could I use unflavored gelatin and vanilla to make them white vanilla cookies? Thank you so much!!! That is a wonderful idea!!! But I really don’t know how it would work..? If you try it, will you let us know? If it works it would open up so many other fun flavor ideas!! Hi i live outside of the US and jello is hard to come by. Do you have any suggestions for substitutes? I was thinking perhaps jelly or marmelade…. what do think? Ps. I dipped some of them in melted dark chocolate for an adult after dinner snack with coffee. Is the “t” in the recipe all teaspoon? Yes, I’m in the process of changing all of my abbreviations to fully spelled-out words, but t is teaspoon and T is tablespoon. I used raspberry jam in place if jello powder because the Red#40 etc. creep me out, and they turned out delicious! And still light & fluffy! Good idea! Glad they worked out for you!! I have a weird question… with the ingredients… is it table spoon or tea spoon? Sorry not a baker but I just have to try these. That’s not weird. I’ve been converting my abbreviations to the whole word- I guess I haven’t gotten this far back! T is tablespoon and t is teaspoon- hope that helps!! I use a hand mixer. I’m not fancy enough to have a kitchen aid- lol! Hubby is on carb free diet…was going to use sugar free jello and was wondering if I should substitute Splenda for the sugar or would the sweetener in the sugar free jello be enough? 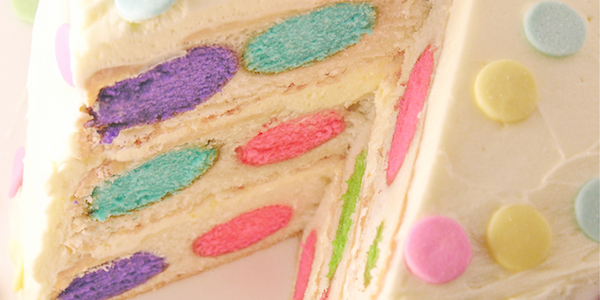 BTW I love your site…..I just love looking at the pictures…I’m here almost everyday 🙂 I love, love, love the polka dot cake….it looks too good to eat 🙂 thank you. Oh thank you- you are so sweet. I’m really not sure on the sugar free ideas- they sound like reasonable substitutions? Give it a shot and let us know!!! I made these sugar free but they are very dark pink. I don’t know why. It is 3 1/2 tablespoons of raspberry jello right? Maybe because I didn’t use sugar? The sugar free Jell-O is just not the right consistency for these…? I’ve tried and they aways flop. You’ll need to use the regular Jell-O. Sorry! T is tablespoon, t is teaspoon and c is cup. I’ve started spelling them out in recipes now- when I started this blog I never imagined anyone from Europe would read it-lol! these are so fun and pretty! Hi there, I made these today but they lost their colour. They lightly toasted. Was my temp too high for a fan forced oven?? I’m not sure? I’ve never used a fan-forced oven before- I think you’ll have to just experiment with baking times??? So sorry I’m not more help..! I’m genuinely not sure…? I would guess not because they get sticky and more chewy if they are left to sit in humid conditions. I think they might lose that crisp feel if frozen. Give it a try, and let us know what happens! 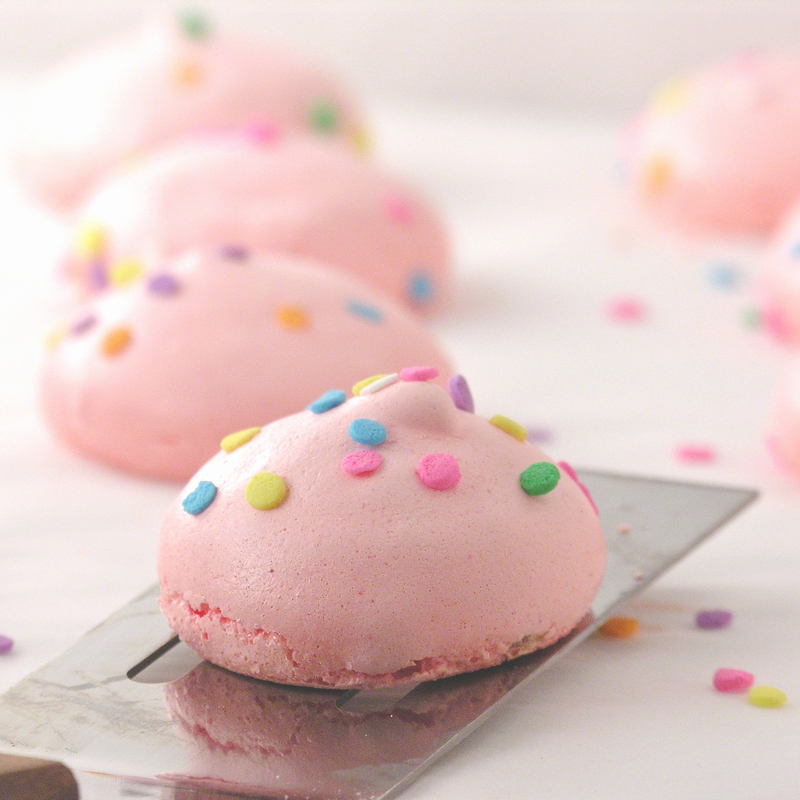 Will baking these for New Year but using strawberry flavored jelly and white chips. Yum! I made these, but instead of using chocolate chips in them, I mashed a few raspberries with a splash of water and sifted it to get rid of all seeds. Added extra raspberry flavour and made them absolutely delicious! Sounds delicious! Thanks for the idea!!! Loved the recipe. Easy and tasty. I’m so glad you tried it and enjoyed it! Thanks for stopping by to comment! This was horrible….are you sure 3 1/2 tablespoons of jello?? So sorry these didn’t work for you! Yes, the measurements are correct. I’m so surprised they didn’t turn out well for you- this is a recipe that has been made by so many people now- and even published in a cookbook. If it was the flavor you didn’t like, these might just not be for you. If the recipe itself didn’t work, I’m not sure what happened…?